Info "Would you please help me by using that parasol to keep the sun off my delicate skin?" Femme Brûlée is one of Dribble and Spitz's Microgames in WarioWare: Smooth Moves. Femme brûlée means "burned woman" in French, and is also a play on the name of the dessert, crème brûlée ("burned cream", lit. in French). 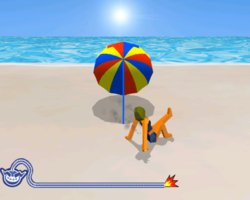 The player has to provide shade for the sunbather from the sun by tilting the Wii Remote to maneuver the umbrella over her. Otherwise, the sunbather will burn and fly off screen. 1st level difficulty: The sunbather moves a bit. 2nd level difficulty: The sunbather rolls around. 3rd level difficulty: The sunbather pops up from the ground in different places. This page was last edited on February 20, 2018, at 15:47.